In 1963, the European Commission began establishing European Document Centres (EDC) throughout the world. Now called European Info and nicknamed “EUi,”* they currently number around 500 worldwide, with 19 in Japan . 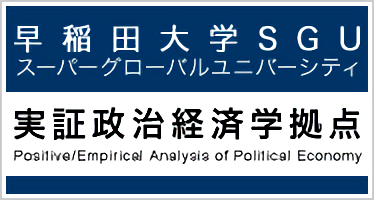 The fourth Japanese EDC was opened at the Institute for Research in Contemporary Political and Economic Affairs in 1978. The EUi is stocked with publications (documents, official journals, and various other materials) issued by the Luxembourg-based Publications Office of the European Commission. These publications are made available not only to Waseda University researchers but also to members of the general public for use in surveys and research. Everyone is welcome to use them. *The European Document Centres (EDC) were renamed European Info (EUi) on October 31, 2006. The official website of the European Union (EU), this site provides a wide range of information on EU institutions and agencies, policies, news, laws and regulations, publications, and statistics. It is viewable in 23 languages. To view in a language besides English, click here. Established in 1974, the Delegation represents the European Commission in Japan. It provides information on the EU and EU-Japan relations in both Japanese and English. Issued 10 times a year, the Bulletin provide month-by-month updates on EU institutions, including any major policies announced in the month and the activities of each institution, classified by field. Each of the featured topics has a reference to the initial text, making it a useful search tool. The first issue of each year includes an index to the publications of the preceding year. The library archives contain all issues going back to the first in 1968, with only a few copies missing. Since 1996, the entire publication has been viewable on the Bulletin of the European Union website. Publication of paper copies ceased in 2006. This is an annual report on the activities of the EU; it is equivalent to a yearly version of the above-described monthly Bulletin. In addition to detailed reports on European Community events and minute descriptions of decision-making processes, there are indices of various laws and regulations, outlines of legislative procedures, and references to Bulletin articles and other related reports. The library archives date back to the 7th edition, published in 1973. TheGeneral Report site on the “Europa” server carries a summary of the 1995-1996 reports and full reports from 1997 onward. The EU official journal, updated daily. The library archives contain the following two series up through 1999 on microfiche and from 1998 onward on CD-ROM. Journals from 1998 can also be viewed using the EUR-Lex search engine. The L Series is an official journal containing the full text of EU legislation, including regulations, directives, and decisions. Official journal offering a wide variety of information and notices from the EU. farm and livestock bidding information, annual reports of the Court of Auditors, competition notices for recruitment by EU institutions, and statements from the Economic and Social Committee. A yearly “Index A-Z” is also available for reference. Reports of cases can also be viewed on CVRIA (the Court of Justice of the European Union’s official website). Paper copies are published with an approximately two-year time lag compared to online reports. Summaries of judgments are also published in the C Series of the Official Journal. The library has all copies from 1954 onward. Papers prepared and released by the European Commission. EU regulations, directives, decisions, and bills (including drafts) are published as COM Documents. Other COM Documents include white papers, green papers, and other important documents. The library archives contain the 1983-2002 publications on microfiche. The full texts of all COM Documents from 1999 onward are viewable on the Preparatory acts page of the “Europa” server. Eurobarometer documents the results of public opinion surveys. The library archives contain publications from 1981 onward. Surveys cover a broad spectrum of topics including EU expansion, social trends, health, culture, information technology, the environment, defense, and the civil rights of EU citizens. They can be viewed using the Public Opinion page of the “Europa” server. Statistical documents issued by Eurostat (the Statistical Office of the European Union). Statistics of all kinds are searchable using the “Europa” server’s Eurostat website. Issued by the European Commission to inform people inside and outside the EU on what the European Union does, what it is for, and how it works. Available in all 23 official languages spoken in the EU. The Delegation of the European Union to Japan provides a Japanese translation for Japanese citizens, with an additional section on “Japan-EU relations.” This is published under the title Europe in 12 Lessons. The Japanese edition is translated from the 2006 edition. Copies are available at the Institute EUi. Public relations magazine in Japanese, edited and published quarterly by the Delegation of the European Union to Japan’s office of Press, Public and Cultural Affairs. The magazine contains diverse information, including explanations of various EU policies, an introduction to Europe, European cultural information, and news. Currently, it is available at the Institute EUi. The latest issue and back issues can be downloaded here. An explanation of how to use various EU documents, published in 2006 by the Delegation of the European Union to Japan. Copies can also be downloaded here. *Click here for a list of other resources published by the Delegation of the European Union to Japan. A great number of documents in general use as well as other useful resources is available. Users can also access databases useful for searching for such documents.  Overview ╢ This site features basic facts and information on the EU, including information on member states, the EU flag, the Union's founding treaty, EU history, and the Euro currency.  Publications ╢ This is the Publications Office of the European Union (EUR-OP) page. A catalog of publications can be accessed here.  Documents ╢ This is the EUDOR (European Union Document Delivery Service) page. This online document delivery service allows users to search official journals and COM Documents and order them on the spot.  Departments and Services ╢ This page is an index of departments and services established by the European Commission. There are currently 38 listings organized thematically.  Legislation ╢ EUR-Lex is a portal site that lets users search for information on EU legislation, including official journals, laws and judgments, and decisions by the Commission and other institutions.  Statistics ╢ This is the page of EUROSTAT, the European Union Office of Statistics, providing access to information on publications, catalogs of statistical documents, and statistical data.  Rapid ╢ Rapid is a searchable database of press releases. Registration is required, but access with a guest ID is possible.  Links ╢ This is a list of links to databases and sites useful for obtaining EU information.  EuropeanVoice.com ╢ European Voice provides uniquely European viewpoints on various topics, with news updated every Thursday. A newspaper is published as well; both the website and newspaper versions provide the latest news and insights from the EU. However, paid registration is required in order to view back issues.